In this part we will explore the meaning of the 42nd Shloka of Sri Vishnu Sahasranamam. Bhagavan is focussed with a resolute mind and regulates everything in the Universe. All things ultimately end in Him and as Phala-data He gives everybody an appropriate position in accordance with their actions. He has Supreme Manifestation of Opulence and has Goddess Lakshmi with him at all times. His Greatness is self-evident and He is Supreme Bliss who is complete in all respects. His glance is auspicious and those who get a mere sight of His eyes are blessed with all glories. Vyavasaaya refers to an activity undertaken with great focus, concentration and conviction. Sri Adi Sankara refers to Bhagavan’s focus on Jnaana or Knowledge by defining this as ‘Samvinmaatra Svaroopaat Vyvasaayah – He is Vyavasaayah because he is fully focussed in Pure crystallised Knowledge’. This can be further explained as the One with a resolute and pure intellect, or One who has True Knowledge of the self. Sri Bhattar interprets this as ‘Atishayena seeyate (badhyate) asmin jyotishchakram iti Vyavasaayah – The circle of planets is tightly bound and closely fastened to Bhagavan, and so He is called Vyavasaayah. Bhagavan is the support for the Stars and Planets as His body represents the Space and so He tightly holds them together. Swami Chinmayananda refers us to Verses 41 and 44 from Chapter 2 of the Bhagavad Gita where the term Vyavasaaya occurs. Meaning: For the focused intellect, there is only one well defined way to go forward; for the unfocussed mind there are so many unclear and vague paths none of which promises success. Meaning: For the unfocussed mind intent on pleasures and wealth and obsessed by such considerations concentration and stability of mind are not possible. Sri Bhattar interprets the next few Namas as referring to the aspect of Bhagavan as Dhruva, the Pole Star. This Nama is derived from the root word ‘Stha’ meaning ‘to establish’. ‘Vyavasthaanam karoti iti Vyavasthaanah’, or ‘Asmin vyavasthitih sarvasya iti Vyavastaanah. One who establishes everything, or One on whom the basis of everything resides; or One who regulates everything in the Universe and the associated functions. Vyavasthaa means ’determination, decision, settlement’ and Vyavasthit means ‘established’. Thus Vyavasthaanah is one who determines everything and One who establishes everything in their respective places or positions. As Adi Sankara further elaborates as ‘Yasmin vyavasthitih sarvasya iti Vyavastaanah – One in whom there is well established place and system for everything’. His alternative definition is ‘Lokapaalaadi Jaraayujaandajodbhijja Braamhana Kshatriya Vaishya Shoodraavaantara Varna Bramhachaari Grihastha Vaanaprastha Sanyaasa Lakshana ashrama Taddharmaadikaan Vibhajya Karoti iti vaa Vyavasthaanah – He has laid down clear systems for various rulers, various living beings (egg born, womb born or seed born), various classes of people (priest class, ruling class, merchant class or the working class), and various stages of life as Lakshana Ashrama (bachelor, householder, the retired or the ascetic). Hence He is called Vyavasthaanah’. Sri Bhattar associates this basis with Kaal or time, which is the basis for everything that happens in this world. This again is determined by the movement of the planets, of which dhruva is the pole or the pivot. So the Vyavasthiti is driven by Time and Bhagavan is the one who controls Time. Krishna proclaims in Gita (11.31) ‘Kalosmi Loke Kshayakrit Pravriddhah – I am the terrible and intrepid Time the conqueror’. ‘Sarvam etasmin santhishthate – samaapyate iti Samsthaanah – One in whom all things have their ultimate end’. Sri Adi Sankara explains this as ‘Atra bhootaanaam Samsthitih Pralayaatmikaa – He is the final resting place for everybody at the time of Pralaya or Deluge’. Alternatively, this can also be interpreted as ‘Sameecheenam Sthaanam asya asti iti vaa Samsthaanah – Ha has the most eminent position’. This eminent position is elaborated by Sri Radhakrishna Shastri as referring to the Milky Ocean, the Solar system (Surya Mandalam), the heart of the Yogis or His position as Dhruva in the Dhruva Mandalam. Sthaanam means position and dah means giver, ‘Sthaanam dadaati iti Sthaanadah – the giver of suitable positions’. Sri Adi Sankara interprets this as ‘Dhruvaadeenaam Karmaanuroopam Sthaanam dadaati iti Sthaanadah – He gives everybody an appropriate position according to their actions, for instance to Dhruva, Hence he is called Sthaanadah’. Sri Radhakrishna Shastri points out that Bhagavan is the One who gave the position to Dhruva which is unlike all the other stars viz. 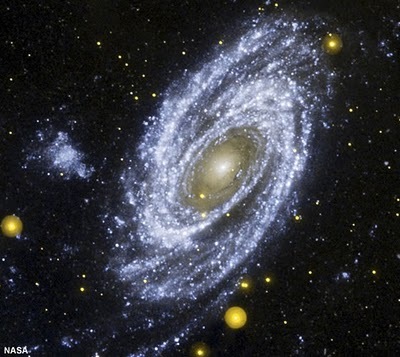 Dhruva is fixed in position in relation to Earth compared to the other star positions that continually change. Swami Chinmayananda gives references to Katha Upanishad – Yathaakarmam yathaashrutam- 2.5.7, and quotes “karma phaladaataa Naraayanah” to reinforce Sri Sankara’s interpretation. The Dharma Chakram writer gives reference to Thirukkural to support the same interpretation “Vaguttaan vagutta vagai allaal kodi toguttaarkkum tuyttal aridu – Even if you have millions you can only enjoy what is ordained by the Almighty”. Sri Satyadevo Vaasishtha comments that Bhagavan gives the suitable position to the Stars in Space, to the Devas in the Antariksha Loka, to the water-living creatures in the Oceans, etc. This Nama comes from the root word ‘dhru’ which means ‘to be steady’. He conferred a status on Dhruva that is as permanent as Sri Vaikuntam. Since He can make any place as permanent as His abode viz. Sri Vaikuntam, the significance is that He is everywhere. Sri Radhakrishnan Sastri comments that Bhagavan conferred on Dhruva that which is only His Nature – viz. the indestructible status, and so Dhruva is Bhagavan Himself. Sri Satyadevo Vasishtha takes the meaning to be “certain” for Dhruva, and points out that even though everything except Him in this Universe is adhruva, by His Nature of Dhruvatva He gives a sense of certainty to everything for e.g. the rising and setting of the Sun is Dhruva. 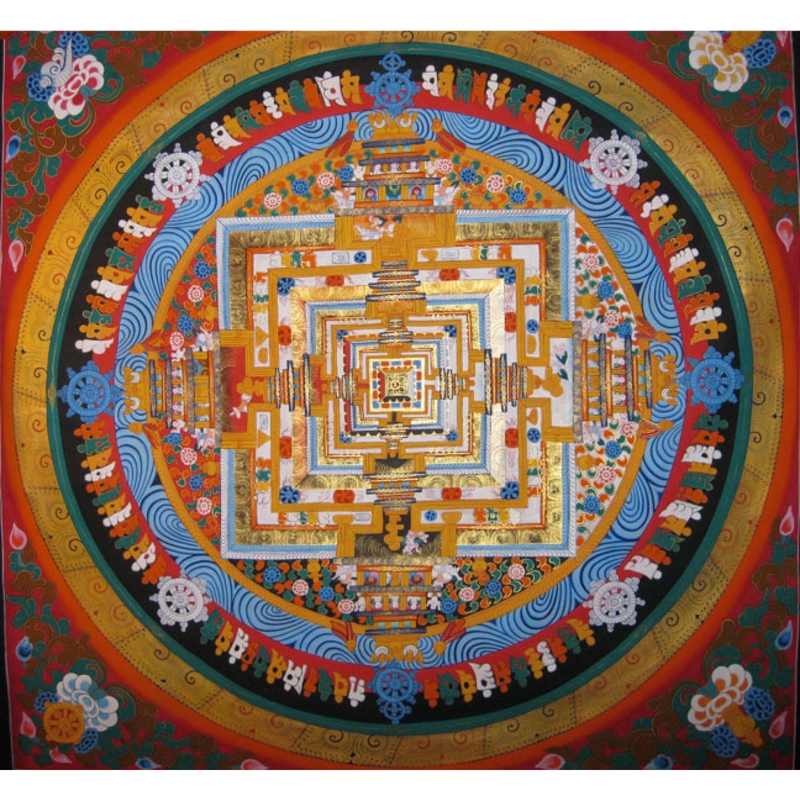 The Dharma Chakram writer points out that in the midst of the cycle of Creation and Pralaya where everything that has been created merges in Him and then reappears, He is the only permanent or fixed one, and so He is Dhruva. Manu (who was rescued by Lord Vishnu in his Matsya Avatar during deluge) had many children. One of them was King Uttanapada who had two wives – the elder one was Sunithi and the younger one was Surichi. Sunithi was a simple and a pious queen while Surichi was very haughty and arrogant. Uttanapada was very fond of Surichi and Uttama, his son born to her. 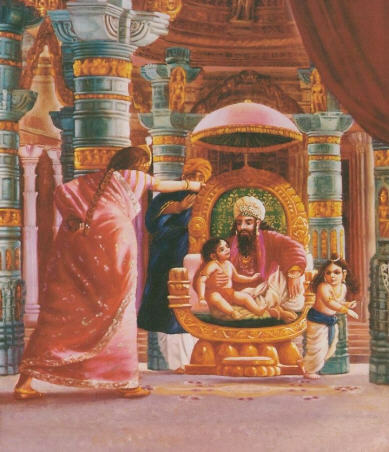 Sunithi gave birth to a son Dhruva and the King could never show similar love to him. One day King Uttanapada took Uttama on his lap and was showing him great affection. Seeing this, Dhruva became equally desirous for his father’s affection and repeatedly tried to climb on to his lap. The King, however, did not have the courage to take Dhruva on his lap in the presence of Suruchi as he was afraid to displease her in any way. When Suruchi saw Dhruva trying to climb on to the lap of his father, she felt a burning hatred inside her heart, and in front of the King she began to abuse Dhruva by saying, “Dhruva, you may be the son of the king, but that does not make you worthy to sit on his throne or on his lap. If you really want to obtain the king’s throne, there is only one thing you can do, pray to the Lord Narayana and seek a boon from Him to be born again in my womb. Only if you take birth from me, will you be able to sit on the lap of your father, as long as you are the son of that unfortunate woman, you will never be able to sit on the king’s throne. So saying, she pushed him away. Listening to the malicious words of his step-mother Dhruva was in tears. He felt hurt that his father did not defend him. King Uttanapada was disturbed by what Surichi had done, his love for his wife weakened him so much that he did not dare to protest. Dhruva became overwhelmed by a mixture of grief and anger, and ran to his mother. Looking at the dishevelled face of Dhruva, Sunithi comforted him. Slowly, with broken sobs, Dhruva told Sunithi the whole story. Sunithi was upset that the King had kept quiet when Surichi had pushed her son, but she knew that she was helpless. She said, Lord Narayana is the Lord of the Universe. 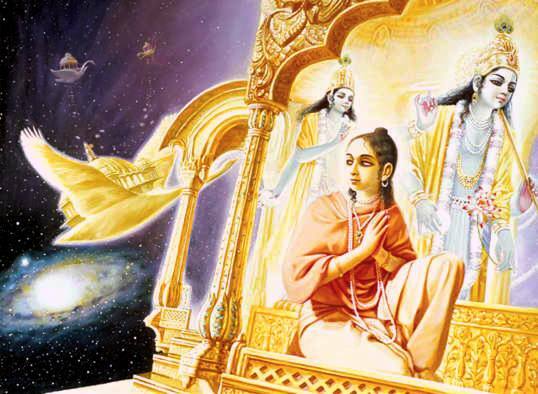 She spoke about the glorious Lord and said that, “The inconceivable Lord Vishnu, who cannot be known through the material senses, protects the entire Universe. Even the great yogis, who have completely controlled their minds and senses, meditate solely on the Lotus feet of Sri Hari. By serving Him, his forefather Lord Brahma obtained the shelter of His Lotus feet, his grandfather Svayambhuva Manu, performed the daksina-bahula sacrifice with great concentration to realise Sri Hari”. Therefore, those who desire liberation try to get the shelter of the Lotus feet of Sri Hari and worship Him to attain their goal. Dhruva looked in awe at his mother’s explanation about Lord Narayana and a strange love enveloped him. He said, ‘Mother if Lord Narayana is that powerful and I will pray to him, meditate on Him and I will come back with his blessings. She asked Dhruva to worship Him leaving aside his anger and ill feelings towards his step-mother. With his mother’s blessing’s Dhruva confidently set out to the forest to meditate on Lord Vishnu. Sage Narada was wandering the world when he saw a young child entering the forest alone and was puzzled. He approached the child and asked him where he was going so excitedly. Dhruva bowed to Sage Narada respectfully and said, ‘Sir! I am going to the forest to meditate upon Lord Narayana. When Dhruva narrated his tale, Narada was moved. He looked at the child and said “My dear son, you are only a five-year-old child. At this age, children should be playing and enjoying their childhood. Whether it be happiness or distress, it would be better for you to go back home and be content by staying there and enjoy the princely lifestyle.” Dhruva replied politely, “O Brahmana! The arrows of the harsh words of my step-mother Suruchi have pierced my heart. Therefore, I am determined to obtain the Supreme position in the three worlds, which could not be attained by my father or my forefathers. So please tell me a way to achieve this, you are so glorious! You always sanctify the Universe by moving like the Sun, chanting the glories of Sri Hari, please tell me about the Lord and how should I meditate on the form of this Great Anantha? Sage Narada after a brief pause continued, “If, however, you still have the desire to follow your mother’s instructions to worship Lord Hari and win His mercy, you should understand that worship of the Supreme Lord is not easy and accessible to all. Here is how you are to meditate on the form of the great Lord Sridhara. Sri Hari’s body and countenance radiate contentment, satisfaction and the desire to bestow mercy. He is eternally young, His lips and eyes have the hue of the rising Sun. His nose is sharp and beautiful, His eyebrows are dark and attractive and His neck is long and splendid. His limbs are extremely attractive, and He is the only shelter for everyone, the Supreme form of all, He is an ocean of mercy. His eyes are full of love and the right side of His chest bears the mark of Srivatsa. His complexion is dark like a new monsoon cloud, He wears a garland made of forest flowers and His four arms hold the conch, disc, mace and lotus. He is adorned by a crown, two beautiful earrings, bracelets and bangles. On His chests rests the Kaustubha Jewel. His exquisite silk robe is yellow in colour; a beautifully crafted ornament graces His waist and precious gems as anklets at His feet. His sweet smile and affectionate looks are always bestowing mercy upon His devotees. His endearing feet, with nails shining like pearls, are resting on the Lotus hearts of those who have surrendered to Him. Dhruva, you should meditate on Sri Hari with a controlled mind and concentrated consciousness. If you constantly meditate on the all-auspicious Lord, He would bless you with the fulfilment of all your desires. He asked him to chant the Dvadashakshari mantra ‘Om Namo Bhagavathe Vasudevaya! In addition he asked him to meditate on all the known incarnations of the Lord and His Namas. 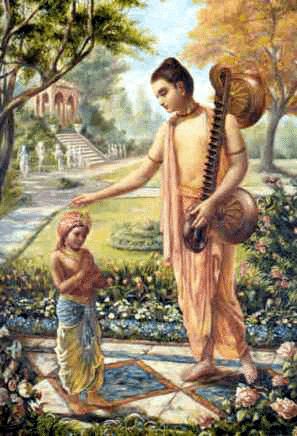 Dhruva joyously prostrated, thanked the Sage and said, “If I do not attain the Lotus feet of Sri Hari, I shall never return home again.” Seeing such strong faith, Narada was pleased in his heart and blessed the young child who sat under a tree and began his penance. Meanwhile, Narada went to the palace of King Uttanapada. The King welcomed the Devarishi with due respect. Sage Narada noticed that the King had a forlorn look and asked him the reason. The King explained him all that had happened and lamented about his son’s safety. 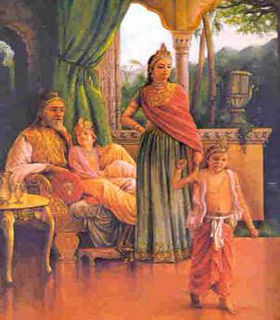 Narada replied that his son was safe and while listening to Narada’s description of the resolve of his son, King Uttanapada became absorbed in thoughts of Dhruva. He was soon rid of his attachment towards his beloved queen and was remorseful. In the forest of Madhuvana, Dhruva had begun performing his austere Sadhana. He meditated on the Lord with full consciousness eating very little. By the fourth month he was only breathing air once every twelve days and, in this way, he conquered his breathing power too, all the while meditating on Sriman Narayana. 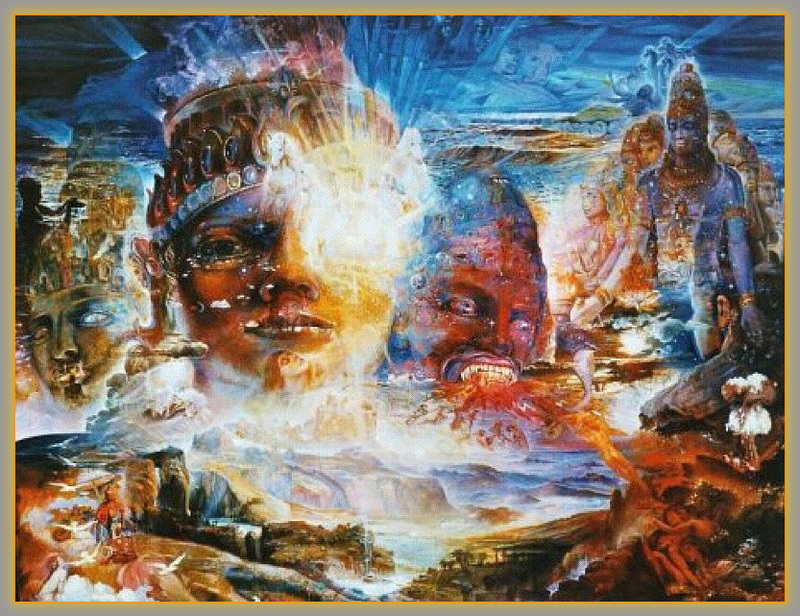 In the fifth month when he conquered Prana through his austerities, the three worlds shook with the power of his penance, the Soul of the Universe scorched, all the Devas and the inhabitants of their planets started choking and felt intolerable because of their inability to breathe. The Lord moved by their earnest supplications said, “O Devas, this choking is caused by a child’s severe penance in Madhuvana Forest. Dhruva has become so absorbed in his meditation upon Me that is causing this upheaval. Please go back to your respective abodes.” Indra and all the other devas were reassured by the words of Sri Hari, and, after offering Him obeisance they returned to their heavenly realm. 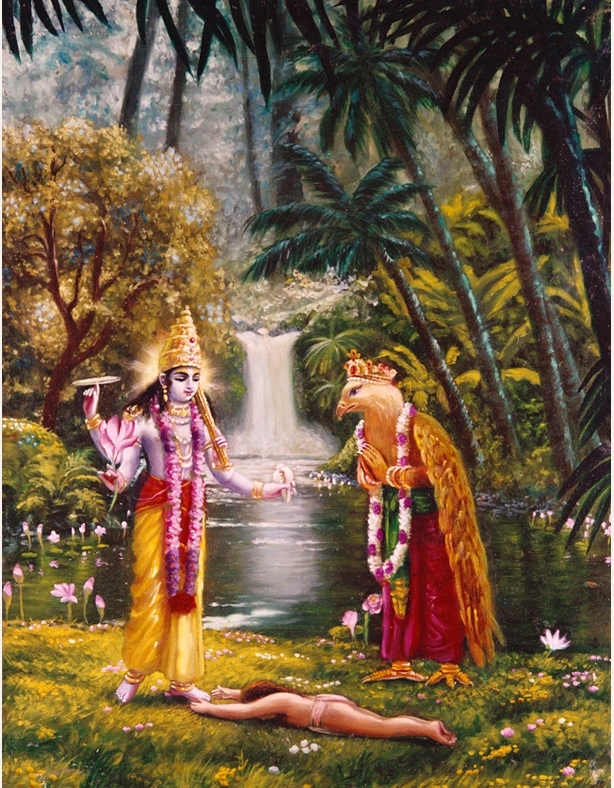 Desirous of seeing His own little devotee, the Lord mounted on Garuda and flew to Madhuvana Forest. Dhruva suddenly felt a flash in his tender heart, as if Sri Hari had personally appeared. He opened his eyes and witnessed the exact form that he had been meditating upon in his mind. The inconceivable, beautiful form of the Lord fascinated him. His mind was firmly fixed upon the Lord and his eyes thirstily drank the sweetness of His form. The five-year-old Dhruva stood with folded hands overwhelmed that he was unable to express his feelings. The merciful Lord understood this and out of compassion for him, He touched the throat of Dhruva with His conch-shell, Panchajanya. The touch of the divine conch-shell conferred upon Dhruva great power of speech. Expressions of the utmost eloquence and refinement danced on his tongue with deep realizations of the truth and the soul. Dhruva’s heart drowned in devotion, while his mind basked in the greatness of the glory of His Lord. Dhruva’s invocations greatly pleased the Lord, desiring to grant him a boon, the Lord spoke thus: “O prince, you have fulfilled your vows perfectly. I am blessing you with all good fortune. I know what you desire and I shall award you the most brilliant position in a place difficult to achieve. This rare place will never be destroyed. Its name will be Dhruvaloka. The planets of the great powerful sages will last until the end of the Kalpa (a time of great cosmic dissolution), but your position will never perish. With steadfast intelligence and adherence to the principles of Dharma, you will protect this earthly Kingdom. At the end of your life you will be reach My abode, the Supreme position worshiped by all planets, which is beyond the abode of the Rishis.” After giving this boon and these instructions to little Dhruva, Sri Hari left with Garuda to His abode. After the blissful encounter with the Paramathma, Dhruva then went back home, where the whole Kingdom received him happily. With the blessings of his father and both the queens, Dhruva was crowned as the King and Uttanapada renounced to the forests. Dhruva ruled the Kingdom for many years, after which He attained Samadhi. 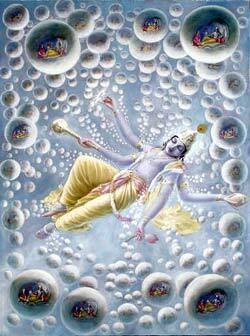 His soul reached the abode of Lord Vishnu. Thus by sheer devotion, Dhruva finally attained a place in the middle of the sky as Dhruva Nakshatra which is more popularly known as the Pole Star. Sri Adi Sankara describes this as ‘Paraa riddhih Vibhootih asya iti Pararddhih – He has got Supreme Manifestation of opulence or affluence’. The opulence referred here denotes both to the personal attributes and the material wealth. Swami ChinmayAnanda points out that Riddhi refers to the combination of prosperity and power. The full explanation of the Riddhi or Vibhooti of Bhagavan is described in great detail in Chapter 10 of the Bhagavad Gita where Krishna enumerates how He represents the top of every species like being Himalaya among mountains, the Sun among shining objects, the Ocean among carriers of water and the Lion among animals. In Verse 40, He says ‘Naantosti mama Divyaanaam Vibhooteenaam Paramtapa – There is no end to the manifestations of my opulence, I have only given you a small sample’. Sri V.V. Ramanujan comments that it is not an exaggeration to say that in no other incarnation do we find the perfection of auspicious qualities as in the Rama Avatar. He gives an additional interpretation: ‘Pareshaam Riddhireva Riddhih yasya – One who considers the fulfillment of others as His own’. After crowning Vibheeshana, Lord Rama felt happy by the sheer act of fulfilling His word – ‘Krita krityah tathaa Ramah’. He also quotes ‘Utsaveshu ca sarveshu piteva paritushyati- When the citizens are happy, He feels happy like a father who feels pleasure at the happiness of his child’. Meaning: Rama has majesty of an Ocean, bravery of Himavan, might of Vishnu, the sweet appearance of the Moon, anger comparable to that of pralaya Agni, patience of Mother Earth, Charity of Kubera, and Truth of Dharma Devata”. Spashta means something, which is explicit or very obvious. Parama means Supreme and can also mean One who has Goddess Lakshmi (“Para Maa”) beside Him. Sri Adi Sankara incorporates both these meanings in his following explanation ‘Para Maa Shobha asya iti asya iti Paramah, Sarvotkrishtah vaa AnanyaadheenaSiddhitvaat Samvidaatmatayaa Spashtah Paramaspashtah – He is Paramah because He is Supreme overall or He is adorned with Goddess Lakshmi and He is Spashtah because His Greatness is explicitly obvious or He is Knowledge personified’. Spashta (pratyaksha, drishtaa) Paaramyah Parama-spashtah – His greatness is explicitly obvious. Sri Parasara Bhattar refers to Ramayana – Vyaktamesha Maha-Yogi Paramatma Sanaatanah – (Yuddha Kandam – 114.4). These are Mandodari’s words when she sees Rama after He slays Ravana in the battlefield. Similarly, Tara (Vali’s wife) recognises Rama’s divine nature as soon as she sees Him and eulogizes him as God in human form – ‘Tvam aprameyashcha duraasadashca…..manushya dehaabhyudam vihaaya divyena dehaabhydayena yuktah’ (Ramayana 4.24.31-32). In Sumitra’s words: “Suryasyaapi bhavet Suryah” – He shines even brighter than the Sun, and He is the One who gives brightness to the Sun. 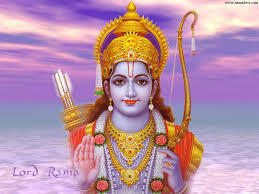 Other references to Lord Rama’s greatness are His being called “Pumsaam drishti cittaapahaarinam”, “Rupa Samhananam LakshmIm tadrishur Vismitaakaaraah”, etc. Narayana Suktam proclaims him as ‘Narayana Paro Jyotih Atma Narayanah Parah – He is the Supreme light and Supreme self’. The Dharma Chakram writer points out that it is this explicit greatness that made Bharata throw away the Kingdom and instead become devoted to Lord Rama. Rama’s allure made Lakshmana to accompany him without a second thought and he served him for 14 years in the forest. And Hanuman was drawn to Rama the instant he saw him and served Him for the rest of his life. Such was the power of his draw. Sri Satyadevo Vasishtha gives an independent interpretation based on the root word ‘spash’ – to bind (spashati – badhnaati), and gives the meaning “One who binds everything in a superb way” for Paramaspashtah. The example of the complex human body, which retains its beautiful appearance in spite of its internal complexity, is given as an example. He gives the following quotes in support: asya spasho na nimishanti (Rig Veda 9.73.4), divah spashah pracharanti (Atharva veda 4.16.4), etc. ‘Tush’ means to be contented and free from wants and desires ad Tushtah means a contented person. Sri Adi Sankara explains this name as ‘Paramananda svaroopaat Tushtah – He is Supreme Joy personified and he is Tushtah’. Instead of being in Sri Vaikuntam where only a chosen few could be with Him, Bhagavan chose to be born as a human to King Dasaratha, so that He was within the reach of everyone. 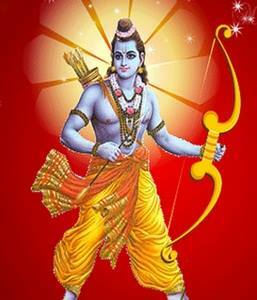 When the Devas appeared before Him in His Rama Avatar and praised Him as Bhagavan, He told them that He was happy to consider Himself as a human, the son of Dasaratha – Atmanam maanusham manye Ramam DasharathAtmajam. As we saw before, He was happy like a father of an accomplished child when His citizens were happy – Piteva paritushyati – He who attained unbounded joy by just fulfilling His word to Vibheeshana and crowning him as the King of Lanka – pramumoda ha. Meaning: Whoever with loving devotion offers unto Me a leaf, a flower, fruit, or water, I affectionately accept that devotional offering from that pure hearted being. Bhagavad Gita Chapter 2 Verse 55 makes use of this term by saying ‘Atmany evaAtmanaa Tushtah Sthita-Prajnas Todocyate – One who finds satisfaction in the Self alone, he is a truly enlightened person or a true Yogi’. The Dharma Chakram writer points out that Bhagavan is Tushtah because He is not subject to the pains and pleasures that other beings are subject to. Rama did not feel instant happiness when He was crowned as a King, nor was He sad when He was asked to go the forest for 14 years. This Nama explains the proper way to realize Bhagavan is to be Tushta or always content, and be witness to the events around us but not be attached to them, with the mindset of a Yogi. As Adi Sankara puts it ‘Sarvatra Sampoornatvaat Pushtah – He is perfect or complete in all respects hence He is called Pushtah’. As described by the Upanishads he is Poorna or the perfect one. Every part is also perfect. Each Avatar or incarnation is equally perfect. The perfection extends to all of physical form, bodily strength and mental and intellectual attributes. Sri Satyadevo Vaasishtha extends this meaning to also suggest that He is Pushtah because He keeps all his Creations fulfilled by making available the means for them to be fulfilled – Pushnaati iti Pushtah’. Shubha means auspicious and Eekshanam means look or glance of the eye so Shubhekshanah is one whose glance is auspicious, namely somebody who showers his blessings just by looking at the devotee. ‘Eekshanam darshanam yasya shubham shubhakaram Mumukshoonaam mokshadam Bhogaarthinaam bhogadam Sarvasandehavichheda kaaranam Paapinaam paavanam Hridayagranther vicchedakaram Sarvakarmanaam kshapanam Avidyaayaashcha nivartakam sa Shubhekshanah’ – His mere sight is so auspicious that it bestows good on all beings; it gives Moksham to the spiritually minded, enjoyments to those that desire them, cleanses sins, burns up all karmas and removes all ignorance and hence He is called Shubhekshanah, a person with auspicious eyes. This applies to both seeing the Lord and being seen by the Lord. Meaning: At His glance the knots of the heart are cut, all doubts are removed and all bad karma is purged. Meaning: Whoever has not seen Rama or whomsoever Rama has not seen, that person stands condemned in this world, and even his own self condemns him”. Kariyavaagip-pudai parandu milirndu Sevvariyodi neenda ap-perivaaya kangal- (934) – He has such beautiful brows and bright long red big eyes. Hanuman described Rama to Sita Devi as “Ramah kamala patraakshah sarva sattva manorathah – where he describes the greatness of His eyes as well as being seen by His eyes. Sita, herself describes Lord Rama thus – tam padma dala patrAksham .. dhanyaah pashyanti me naatham – Blessed are those who see the beautiful Lotus-like eyes of my Natha. The Dharma Chakram writer points out several examples of individuals who benefited by the mere sight of Bhagavan falling on them. Guha, Hanuman, Shabari and Vibheeshana to name a few who were blessed by the divine glance and grace of Lord Rama. He is Vyavasaayah because he is fully focussed with a resolute and pure intellect. He establishes everything and regulates everything in the Universe and so He is Vyavashtaanah. He is Samsthaanah as all things ultimately end in Him. He gives everybody an appropriate position according to their actions and hence He is Sthanadah. He is fixed and gave Dhruva a fixed abode as the Pole Star. He is Supreme Manifestation of opulence and so He is Paramrdhih. He is ParamaSpashtah as He is Supreme and adorned with Goddess Lakshmi. He is Tushtah as He is Supreme Joy personified and He is perfect or complete in all respects hence He is called Pushtah. He is Shubhekshanah as His mere sight is auspicious and He showers his blessings just by his glance. Hari Om! Amazing explanation and apt story. This shloka from Srimad Bhagavatam, 4.9.6 is extremely sweet and appropriate to the context. Aishvaryaji thank you for adding even more value to this Blog. Hari Om. Thank you for your blessings. Balaji sir. Hari Om! Thank you Aishwarya! You have a good flair for quoting a pertinent and relevant Shloka each time 🙂 Thanks for that Shloka from Bhagavatam! Om Namo Narayanaaya! God bless you ! Thank you sir for you spontaneous reply, feeling blessed. You have written such a beautiful commentary, my shloka is just a bit like rain a drop in comparison. Keep up the great job sir. Hari Om! No words to express sir! Simply the best!!!!!!!!! Hats off!!!!!! Even an atheist will become a stauch devotee of the Lord. Hari OM sir, Felt very overwhelmed on reading the story of Dhruva Maharaj. Your images are divine and makes it all the more interesting. Thank you sir. Stay blessed. Thank you Nirmala ji! God bless you! Hari Om!!! Om namo bhagavate Vaasudevaaya! Uncle. This mantra is known as a mukti mantra or liberation mantra too. Uncle you have mentioned this mantra in an earlier chapter as dvadashakshari. Jai shree Ram! 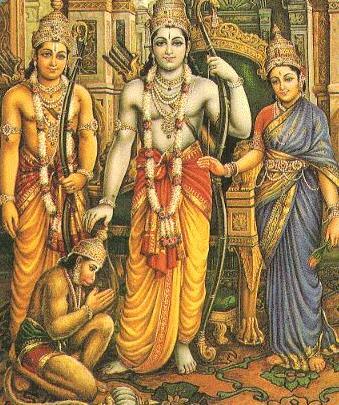 for the beautiful picture of Lord Rama. Very divine love of Dhruva towards lord Vishnu. I keep teasing my brother that its a real waste having the name of Dhruva, he is no where like prince Dhruva. So much devotion. I can’t believe it. Uncle you choose everything so well. The pictures, the story, everything is very beautiful. Narada muni must have explained this shloka to prince Dhruva. whose Chest is adorned with the radiant Kaustubha gem I look with wonder at the four armed form of Sri Vishnu and Bow my head before Him. Thank you Shambavi 🙂 I love your enthusiasm and keenness <3. Yes, Indeed. That is one of the Dhyana Shlokas in Sri Vishnu Sahasranamam aimed to secure the image of the Lord vividly in our mind’s eye before we start chanting the main Vishnu Sahasranamam.